Waze has a police-tracking feature that law enforcement opposes. 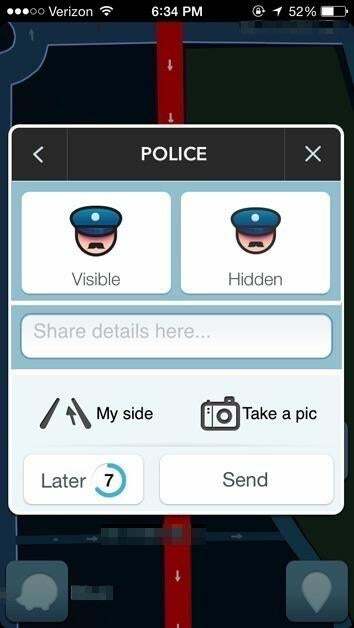 Check for cops or report police sightings on Waze. The GPS app Waze crowdsources a lot of real-time data, and with 50 million users contributing information in 200 countries, the app can show a lot. There are traffic updates, accident reports, and toll warnings. Users can even contribute the location of police they happen to spot, so drivers behind them know to stay within the speed limit and generally drive safely. But law enforcement agents are not happy about it. Though the feature has existed since around the time Waze launched in 2008, law enforcement officials are increasingly concerned about it since two New York police offers were shot to death in December. The shooter, Ismaaiyl Brinsley, does not seem to have used Waze to locate the two officers he killed (because he was not carrying his smartphone for a few hours prior to his attack), but he did use the Waze police-tracking function in December and even posted screencaps of it to his Instagram. Waze is owned by Google, and as the Associated Press reports, Los Angeles Police Chief Charlie Beck sent the company a letter on Dec. 30 explaining that Waze could “endanger police officers and the community” by tracking law enforcement. Given the extensive data and geolocation tracking techniques law enforcement is able to use on both a state and federal level (often without a warrant) to monitor United States citizens—and others—it seems contradictory that citizens shouldn’t be able to share information about police officers who are in plain sight.